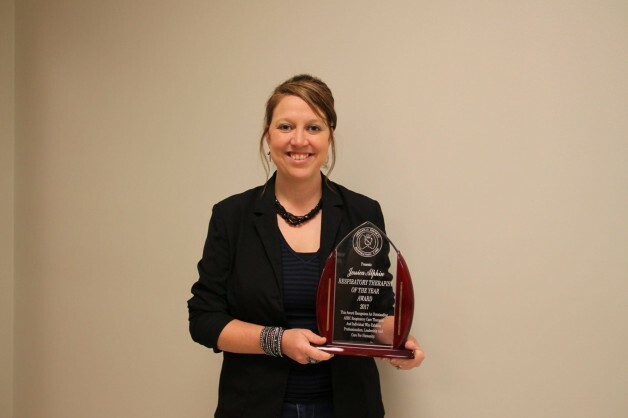 As Jessica Alphin, Director of Clinical Education at Black River Technical College (BRTC) and president elect of the Arkansas Society for Respiratory Care (ASRC), prepared for ASRC’s annual meeting she thought she would be the one presenting awards however she was shocked to learn she had been named Arkanasas’s Respiratory Therapist of the Year. Alphin has been a respiratory therapist for 14 years, five of which she has been working full time for BRTC. In 2015 she was named Educator of the Year by ASRC. In January she began her one-year term as president of ASRC. “I absolutely love being a therapist! The feeling of saving lives and helping others is incredible. It is such an honor to be recognized among such an elite group of healthcare professionals!” says Jessica Alphin. The ASRC state meeting was held September 20-22 in Hot Springs. For more information about BRTC’s Respiratory Care program call (870) 248-4000.